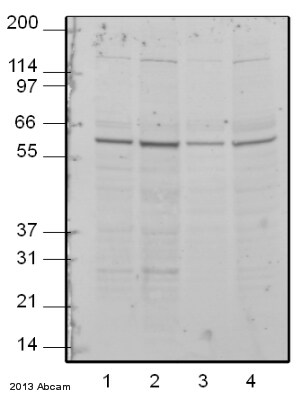 Recombinant fragment corresponding to Human AGPS aa 370-658. Our Abpromise guarantee covers the use of ab155492 in the following tested applications. Glycerolipid metabolism; ether lipid biosynthesis. Defects in AGPS are the cause of rhizomelic chondrodysplasia punctata type 3 (RCDP3) [MIM:600121]. RCDP3 is characterized by rhizomelic shortening of femur and humerus, vertebral disorders, cataract, cutaneous lesions and severe mental retardation. Belongs to the FAD-binding oxidoreductase/transferase type 4 family. Contains 1 FAD-binding PCMH-type domain. Peroxisome membrane. Localized to the inner aspect of the peroxisomal membrane. Immunohistochemical analysis of paraffin-embedded Human hepatoma tissue labeling AGPS with ab155492 at 1/500 dilution. ab155492 has not yet been referenced specifically in any publications. Publishing research using ab155492? Please let us know so that we can cite the reference in this datasheet.